Bean is a reusable component which mostly contains the setter and getter values, we also called it as mutators. Syntax: <jsp:useBean id= "nameOfInstance" scope= "page | request | session | application" class= "package.class" type= "package.class > </jsp:useBean>. The <jsp:useBean> is a standard action element used to locate or instantiates a JavaBeans component. Firstly <jsp: useBean> tries to locate an instance of the Bean class if found its fine, if not then it will instantiates it from a class. 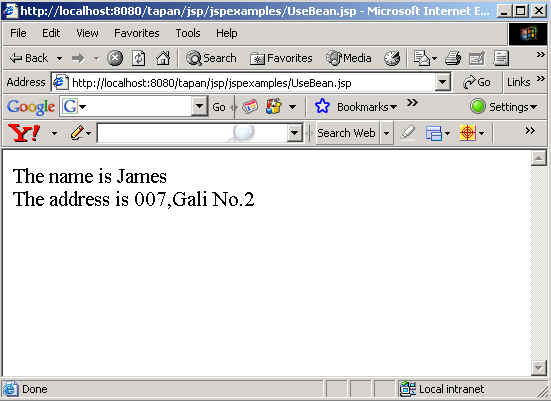 The name of the bean is same as we have given in id attribute of <jsp:useBean>. If the object reference doesn't exist with the name we have specify then it will create a instance and find the scope of the variable, class attributes defines the bean class and type attribute defines the parent class or interface of the Bean class. 1. page: It means that we can use the Bean within the JSP page. 2. request: It means that we can use the Bean from any JSP page processing the same request. 3. session: It means that we use the Bean from any Jsp page in the same session as the JSP page that created the Bean. 4. application: It means that we use the Bean from any page in the same application as the Jsp page that created the Bean.